When I was a young child, I was fascinated by the local native history of the Fairfield and Bridgeport areas of Connecticut where I was growing up. One of the main indigenous communities were the Pequots, a tribe I felt a very familial connection to. 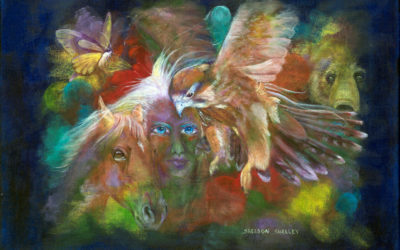 Little did I know that later in life they would be significant spirit allies and ancestors for me in my shamanic practices. And little did I realize that I would be doing healing work around war trauma connected to them. The Pequots were – and are still today – a local tribe in Connecticut. 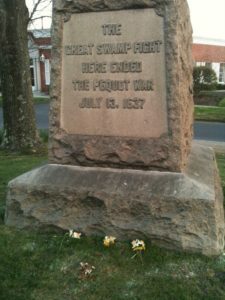 On July 13, 1637, they were defeated by the English and their allies, the Narragansett and Mohegan tribes, in the Pequot War, also known as “The Great Swamp Fight.” Many sites connected to this war exist throughout Connecticut, and a significant amount of them in Fairfield, Connecticut. 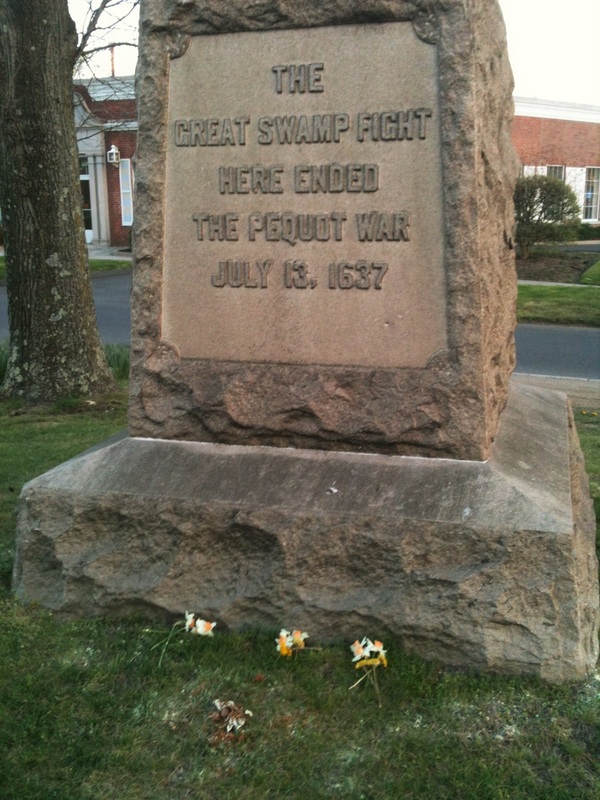 Today a monument stone resides on Route 1 in Fairfield that marks the end of this extensive battle. The Pequots are known as “The Fox People.” The first indigenous people of the Connecticut region, they are a tribal community of the Algonquin peoples. When Europeans settlers began arriving in the area in the 1600’s, they learned how to hunt, fish, grow crops and use various plants for medicinal purposes from the Pequots. When conflict between the Pequots and European settlers arose, it resulted in the Pequot War. Devastation ensued for the Pequots, and the remaining survivors were either sold into slavery and shipped to the West Indies and New York or placed under the control of other local tribal communities. After much strife, the Pequots still have an active reservation in Connecticut – the Mashantucket Pequot Tribal Nation. These indigenous people have spent years rebuilding their community, regaining their land from illegal trades and sales, and establishing their heritage and its connection to the development of Connecticut’s history. In my earlier years of shamanic practice, the Pequots began calling me. They would appear in journeys and show me various landscapes. After these journeys, I would be physically in an area (sometimes months after the journey) and have a “déjà vu” feeling when I was there. I would have feelings of “having been here before” or receive specific visuals of the landscape, and sometimes these visuals would be the site I was physically standing in, but from an earlier time period. I would also begin to feel sensations in my body that I knew were not mine, or emotions that were not mine. When I received the feelings, or visuals, or emotions, pieces began to come together, and it would click, and I would then remember a vision, feeling, or experience from a previous journey connected to the landscape that I was currently physically standing in. As the journeys progressed, I began to get more information. It often came in spurts, and was like putting puzzle pieces together. Different Pequot warriors would appear to me and speak a native language, and point to land or themselves. At the time I didn’t understand it, but would write down what I saw or heard, only to find out later that the words they were speaking in the journey were Algonquin dialect, the basis of the Pequot language, that I had no knowledge of. The language and visuals usually directed me to specific areas of land, specific waters, or parts of local woodlands. I would then find these areas in unexpected ways, sometimes while driving to run an errand, taking a hike in the woods, etc. Those “déjà vu” moments would come when I was in these places, and I would realize that they were connected to the continued journeys I was receiving from the Pequots. After putting some of these pieces together, I began to realize that the Pequots not only wanted some type of healing for themselves, but also for their land. And so, I began doing ceremonies in the area to bring healing and harmony, and to honor the land, the Pequots, and their perpetrators. As I began doing these, a more significant ceremonial call presented itself. One day as I was journeying, an old long-forgotten memory came up. The journey I was doing had nothing to do with this memory, but Spirit wanted to make sure I got the message. The memory was connected to my grandfather, who in his later life, worked for the Town of Fairfield. When I was about ten years old, my grandfather and his crew were refurbishing the existing parking lot at a local library. During this process, the crew discovered a Pequot burial ground underneath it. The town removed the bones, and re-interred them in another burial spot in Connecticut, and then the crew finished the parking lot. When this memory arose, I instantly knew that the memory had appeared for a reason, and that I had to do ceremonial work to honor the site from a shamanic perspective. I gathered with a few other shamanic practitioners on a spring evening at the site. We rattled, drummed, sang, gave offerings, said many prayers, and made ceremony to the spirits. We drummed and sang to call in sacred space, sang ancestral medicine songs and prayers, and then did individual prayers to honor all of the victims and perpetrators by community – the Pequots, Mohegans, Naragansetts, and European settlers. We also honored all of the spirits of the land. We left offerings of cornmeal, tobacco, sage, flowers, and acorns with prayers for all individually. I also added personal prayers and offerings for my grandfather as well. We did a significant amount of drumming and rattling as the spirits guided us. It was a powerful moment to say the least. I felt a huge karmic shift not only for the tribes but also for my own family, as my grandfather had been part of this incident. After we finished ceremony, we took some photos. Amazingly, many of the photos contained orbs and spirit lights which we took to be a confirmation the spirits had heard our prayers, and that they had been there for the healing. It was really beautiful. Over the next few years I continued more ceremonial work as information in the journeys presented. Ironically, when clients called for space clearing and blessing work, their homes were usually located on significant Pequot sites in the area. 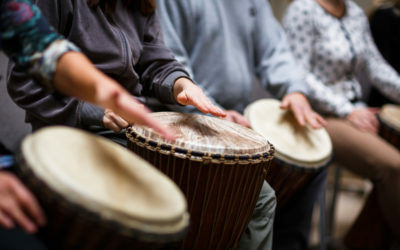 In addition to my monthly drum circles, I also began hosting a special ceremonial drum circle every year on the anniversary of the Pequot War for ancestral, karmic, and land healing, and for all involved. We gathered in sacred circle and space, and drummed our prayers to all victims and perpetrators, gave offerings for them in our bonfire, and honored all spirits that came forward who wanted to be seen for healing connected to this war. We also did prayers from the heart for healing and peace between all victims and perpetrators. Everyone in circle had really intense journeys that were connected in some way – whether it was individuals seeing the same vision, feeling the same emotion, or describing the same spirits. I continue to facilitate this special drum circle yearly. This past year another significant ceremony arose at a local school where my mother was working. The custodian staff has all shared stories with her of paranormal experiences at the school in the late hours of the evening. Some of the paranormal experiences entailed hearing voices, objects moving, strange bangs or rapping sounds that seemed to come from no origin. In this discussion my mother mentioned to the custodians that I did shamanic work and suggested that I come to the school and speak with them. We arranged to meet on a Friday evening. That Friday morning I woke up and had a vision of a spirit connected to the school. It was an old man, and he was very angry and upset. This spirit kept telling me me, “They took it, it was mine,” and then he showed me farmlands. Based on what I felt and saw, I suspected that this old man was a farmer who owned the property prior, and somehow the school acquired it unfairly. I also had visions of the Pequots connected to this as well – seeing them in active battle on the land. My mother contacted me that morning to confirm we were meeting, and asked if I had any visions yet. I told her what I saw, and she said there was a connection but that she was not going to tell me the history of the school, of which I had no prior knowledge, until I got there. So, later that night I went with my mother and met the lead custodian and walked through the school. I also shared with him my visions from earlier that morning, and told him we would be doing cleansing and ceremonial work for healing. After hearing about the visions, the custodian seemed quite surprised. He then began to tell me that he had worked there for twenty years and knew the school history well. He explained that the land was originally owned by a farmer, and the town approached him on numerous occasions to buy it. Each time the farmer refused to sell his land. After the farmer died, the town approached his widow, and ended up unfairly taking the land from her. Shortly thereafter the school was built. He also shared with me that there was quite a lot of Pequot history with that land. As we walked through the school together, more visions came, specifically visions of the Pequot. At one point, I saw all of them standing in a large group with blood coming out of their mouths and down their bodies. They were trying to tell me that something significant happened here and that this was definitely their land. They also made me feel that something happened with a land treaty that had gone bad, and as a result, they died for it. After seeing what was completely on the property – land issues from a previous European owner, and also battle trauma connected to the Pequots – we decided to do some significant ceremonial work for all victims, perpetrators, and the land. We went outside behind the school, and gathered in the direction of the west. I had my mother and the custodian set sacred space with me, participate in ceremonial work, and leave some offerings for all. We honored all of the Pequots and their perpetrators, the trauma of war between peoples, and the trauma it caused on the land, and the farmer and his perpetrators. We did prayers, medicine songs, drumming, and offerings for each, and infused them with energy of love. Once we finished ceremony, I asked my mom and the custodian to stand behind me and face the west as I did some psychopomp healing work, and for them to send prayers as I did so. When I completed the psychopomp work and finished singing my final medicine song, I stopped rattling. Immediately I heard “Oh my God” from both of them behind me. I still had my eyes closed in gratitude. I opened them, turned around, and asked them what they had seen. They said that as soon as I finished singing and rattling, a large shooting star fell down over our heads into the west, the direction I had helped the spirits cross over. We all took this as a beautiful and definite sign that the souls and the land had received healing. I then completed further soul retrieval work for the land. We all left that night, feeling a sense of peace and relief that all were acknowledged and received healing: the land, the Pequots, the farmer, and all the victims and perpetrators involved in this land crisis. The next morning, my mother called me. She had been collecting information about the school’s history for a bulletin board. One of the articles she pulled out that morning related how the man for whom the school was named had been granted the land that the school now stood on for his outstanding efforts as a leader in the war against the Pequots! It was a surprising turn of events, and confirmed my understanding of why I had seen the Pequots appear with blood flowing from their mouths and bodies when I was physically in the school. Now it all came together for me. It was the original wound on the land that was repeated hundreds of years later with the farmer and his wife, the wound that comes from land unfairly taken. The following morning one of the crystals I was wearing during the ceremony the night before snapped in half by itself. Ironically, this stone was given to me for protection from negative energies and trauma. I knew the stone had done its work, and needed to be honored. 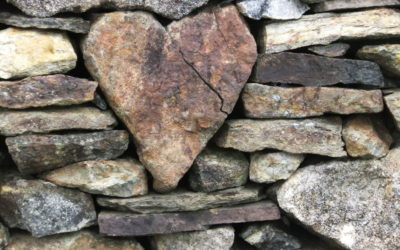 I went to the Pequot memorial stone that day and buried it with offerings. I think it belonged with the Pequots, the original inhabitants and victims of that land. Every little bit of shamanic work makes a difference, whether we think it does or not. Every ceremony, every prayer, every drumming, all add to the collective consciousness for healing. I am very grateful for my spirit allies, the Pequots. I give thanks to them for being open to working with me, allowing me to walk on their sacred land, and for their continued presence in my shamanic work. With feelings of great humility, I will continue to answer their call as they continue to lead me. Jessica Hunter is a shamanic teacher, practitioner, and shamanic medium, and is also an OM with Circle of the Sacred Earth. 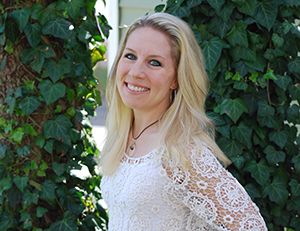 She is in private practice in Bridgeport, Connecticut, and offers private healing sessions, workshops, and training programs in Reiki, crystal healing, and shamanism. More information on Jessica can be found at www.hunterhealinghands.com.